Who was John Philip Sousa? And what did he think about music, politics and the world? These questions are put forth and answered to some extent in a new book “A Sousa Reader” by Bryan Proksch. Dr. Bryan Proksch is an associate professor of music literature and musicology at Lamar University in Beaumont Texas. He is a historian of brass music and has written extensively on the music of Joseph Haydn. “A Sousa Reader” is a collection of newspaper and magazine articles along with interviews given by John Philip Sousa. Indeed, the standard books on Sousa’s life and music gives us much information on the great American composer who was our “March King.” Paul Bierley’s extensive research is at the core of our knowledge of Sousa’s life along with wonderful follow-up books on him by Dr. Patrick Warfield and Loras Schissel. To be sure, however, books on Sousa were written before Bierley’s life long investigation. Sousa wrote his own biography, “Marching Along”, and books by authors Ann M. Lingg (“John Philip Sousa”) and Ann Weil (“John Philip Sousa –Marching Boy”) brought Sousa’s life to the general public in accessible if not anecdotal writing. 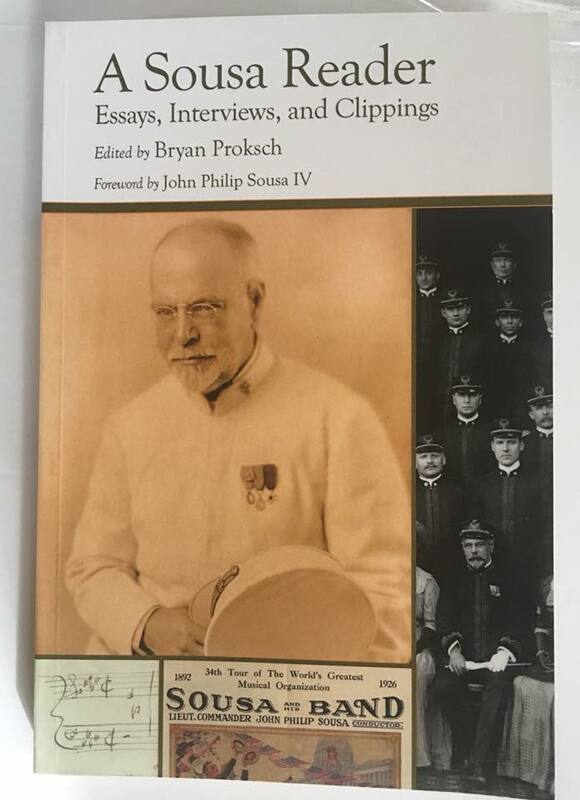 Proksch worked with Sousa’s Great-Grandson, John Philip Sousa IV, on this book and spent time at the Sousa Archive at the University of Illinois, identifying, transcribing, and editing the writings to be included in the collection. “A Sousa Reader” brings a unique collection of articles that reveal some fascinating information about Sousa. His letters to the editors, responses to the structure of marches as performed, politics, views on women, views on prohibition, the advent of recording, nationalism in music, jazz, and even his own recipe for his “Spaghetti Portuguese” are found in this book. Of interest to me was, while Sousa was director of the US Marine Band, he tried to replace “Hail To The Chief” with his “Presidential Polonaise.” We find in this book that he also tried unsuccessfully to change the standard wedding marches of Mendelssohn and Wagner with a new work of his own. We also find that he decried Boston Symphony’s conductor Karl Muck for not playing the “Star-Spangled Banner” at the beginning of concerts during the WWI era. This is interesting in that 100 years later there are discussions about the performance the anthem at the start of orchestral concerts. Sousa’s contributions to American music and our culture as a whole cannot be underestimated. He was one of America’s greatest “Superstars” in an era before that term was even born. Like the superstars of music and film today, Sousa spoke out on issues in which he believed. And like some who support causes today and receive backlash from their stance, Sousa was at times criticized for his opinions. One in particular, found in “A Sousa Reader” concerns his views on the 18th Amendment (known as Prohibition) in which he referred to the law as a “tragedy.” During an interview about a upcoming concert he talked about how the government should have dealt with the issue of drinking liquor. It was a hot topic and Sousa was the object of letters to the editor to which he responded. This all makes for interesting reading as does his views on Jazz music. Dr. Proksch has arranged the articles in chronological order rather than by subjects. This gives the reader a feel for the progression on life in the United States. In addition Proksch edits the articles with prefaces (in italics) and footnotes describing contemporary references that might be lost on the modern reader. This makes it easier to put Sousa’s remarks into better context. A bibliography is included at the end of the book. This is a worthy book to add to your collection of Sousa books or to have as a resource for insights into the life of one of America’s most revered citizens. Jari Villanueva is the author of “Twenty-Four Notes That Tap Deep Emotions-The Story of America’s Most Famous Bugle Call” He is a retired member of the US Air Force Band and a retired program manager from the State of Maryland. He is a life long fan of Sousa and administers the John Philip Sousa Facebook page. « What is Veterans Day? This entry was posted on Monday, November 13th, 2017 at 8:32 am	and is filed under Bugle Stories, Buglers Through History, General Interest, Getting Started on the Bugle. You can follow any responses to this entry through the RSS 2.0 feed. You can leave a response, or trackback from your own site. A very informative and concise review.